Ack! I'm in a serious reading funk at the moment and I'm still moving along with Uncle Tom's Cabin . (Apparently giving myself an extra week gave me even more time to procrastinate!) I hope to have it completed by the week's end and will post my review on Monday (Lord willing). In the meantime, I'm grateful to Barbara H. at Stray Thoughts for selecting this book for us to read this month and for hosting the discussion of it. Here are Barbara's thoughts, in part. You can read her complete thoughts HERE. 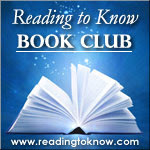 Discussion for this month's book will be hosted here at Reading to Know, on this post. If you read along this month and wrote up a blog post talking about your impressions and experience, please leave the link to your remarks in the comments below. If you do not have a blog, feel free to join in on the conversation in the comment section. Without further ado - here is Barbara . . . It is said that when Abraham Lincoln met Harriet Beecher Stowe, he said something like, "So this is the little lady who started this great war." Unfortunately we can't know if that really happened, but we do know the book had tremendous influence. Uncle Tom's Cabin is a story on two levels. On one level we trace Tom's life and the people he encounters through three masters, and we see how he responds to the difficulties he faces by God's grace. On another level Beecher demonstrates many times over that slaves are real people rather than property and have real souls and real feelings and real family ties and, therefore, slavery is a horrible thing for one person to do to another and for the nation to allow. I understood and appreciated Mrs. Stowe's desire to show the evils of slavery, both in practice and principle, with good masters or bad, but I hadn't appreciated how she did this in quite so many layers until this reading. Just about every character and many of the conversations show by either what is said or what is happening, positively or negatively, plainly or by inference, the various ways in which slavery is wrong and why. She also shows the preeminence of Christianity through Uncle Tom as well as several other characters: Mrs. Bird, the Quakers who help not only runaway slaves but also the injured Loker, Eva, and several others. Stowe's writing has its flaws by today's standards -- some characters are too idealized, some passages are wordy, others are preachy, some scenes are a little too melodramatic or sentimental. But she shines in others. Though today we would let a scene speak for itself rather than turn around and appeal to the reader as she does, in some scenes she has a delightful ironic touch, such as in slave trader Haley's expostulations about how humane he is or Marie St. Clare's lamentations, and biting sarcasm in others, such as her comments about the man who helped Eliza out of the river. Her style probably went over better in her day, but the truths she conveyed are timeless. And it is because those truths -- the value of every human life, the Christian way to respond to adversity, the Christian responsibility to live and act in a way that reflects their savior and to defend the defenseless -- that this book is a classic and is still valuable reading even in our day. 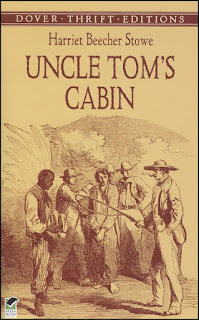 Read Barbara's complete review/thoughts of Uncle Tom's Cabin. Thank you, Barbara, for hosting! Barbara's thoughts are worth reading in full. Here are my thoughts written late last night since though I finished the book on time I procrastinated on writing the review! I too have procrastinated! I am only about 3/4 of the way finished. Im sure it will take me another week the way that I have been reading. But it is a great book and I will finish it. FYI - I'm planning to read everyone's thoughts once I finish the book myself...hopefully this weekend! And here - finally - is mine!